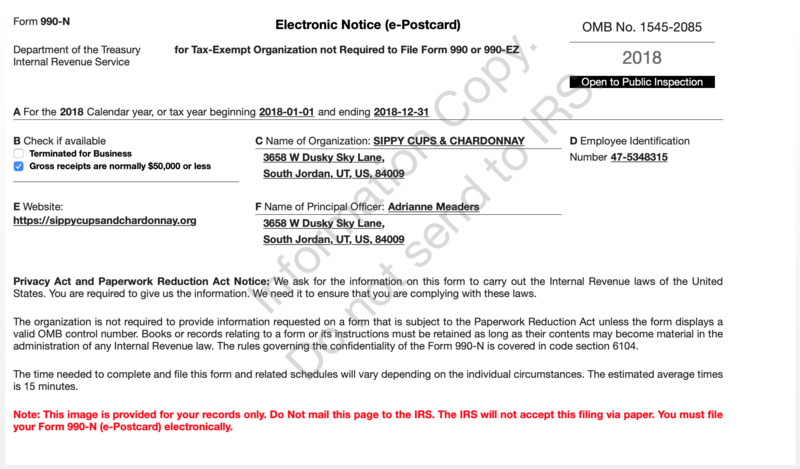 Sippy Cups & Chardonnay officially became a 501(c)(3) exempt organization, or public charity on January 8, 2016. As such, we are required to make certain documents available to the public. Below are links to download our 1023 application (including supporting documentation), IRS determination letter, and 990 filings for the last three years. Utah Charitable Solicitations Permit – Expires April 1, 2019 – Our 2020 one is on its way! City of West Jordan Business License – Expired March 31, 2018…Our South Jordan Business License will be added very soon!